This chapter describes how to add and use custom SOAP header elements. For information on adding header elements when faults occur, see the chapter “SOAP Fault Handling,” earlier in this book. A later chapter discusses WS-Addressing header elements. For information on WS-Security header elements, see Securing Web Services. Informally, each header element is often referred to as a “header.” This is not strictly accurate, because the message itself can contain at most one header, which is always <Header>, with an appropriate namespace prefix. The header can contain WS-Security header elements, WS-Addressing header elements, and your own custom header elements. A header element carries additional information for possible use by the web service or web client that receives the SOAP message. In the example shown here, this information is carried within XML elements. A header element can also include XML attributes, although none are shown in the previous example. The SOAP standard specifies three standard attributes (mustUnderstand, actor, and encodingStyle) to indicate how a recipient should process the SOAP message. InterSystems IRIS represents each header element as an instance of %SOAP.Header or one of its subclasses. %SOAP.Header is an XML-enabled class with properties that correspond to the standard header element attributes (mustUnderstand, actor, and encodingStyle). InterSystems IRIS provides specialized subclasses of %SOAP.Header for use with WS-Addressing and WS-Security. To represent custom header elements, you create your own subclasses of %SOAP.Header. When an InterSystems IRIS web service or client receives a SOAP message, it imports and processes the message. During this step, if the message contains a header with custom header elements, InterSystems IRIS compares the header elements to the list of supported header elements (discussed in the next subsection). To use these header elements, your InterSystems IRIS web service or client can access the HeadersIn property. If the SOAP message did not include a <Header> element, the Count() of the HeadersIn property is 0. Similarly, before your InterSystems IRIS web service or client sends a SOAP message, it must update the HeadersOut property so that it contains any custom elements you want to include in the outbound message. If the HeadersOut Count() is 0, the outbound SOAP message does not include a <Header> element. For custom header elements, you always use the HeadersIn and HeadersOut properties. For WS-Addressing, use the AddressingIn and AddressingOut properties rather than the HeadersIn and HeadersOut properties. See the chapter “Adding and Using WS-Addressing Header Elements” later in this book. For WS-Security header elements, use the WS-Policy features, described in Securing Web Services. Or directly use the SecurityIn and SecurityOut properties, discussed in the same book. This is generally more work. InterSystems IRIS SOAP session support uses the HeadersIn and HeadersOut properties. See the chapter “SOAP Session Management,” later in this book. InterSystems IRIS web services and clients automatically support WS-Addressing and WS-Security headers, but do not automatically support other headers. The WSDL for a web service advertises the header elements supported by that web service and permitted by web clients that communicate with that web service. If you add SOAP headers manually by setting the HeadersOut property, be sure to declare them in an XData block as described in “Specifying Supported Header Elements,” later in this chapter. Also specify the class parameter USECLASSNAMESPACES as 1 in the web service class. If you follow these steps, the WSDL contains all the applicable information. Otherwise, it does not, and you must save the WSDL to a file and edit it manually as needed. If you add WS-Security headers by setting the SecurityOut property (as described in Securing Web Services), the WSDL does not include all needed information. (This is because the WSDL is generated at compile time and the headers are added later, at runtime.) In this case, save the WSDL to a file and edit it manually as needed. For many reasons, it is simpler and easier to add WS-Security elements by using WS-Policy, as described in the same book. With WS-Policy, the generated WSDL includes all needed information. In other cases, the generated WSDL includes all needed information. Note that the W3C specifications do not require a web service to provide a generated WSDL. If a given header element specifies mustUnderstand=1, the element is considered mandatory, and the recipient must support it. The recipient cannot process the message unless it recognizes all mandatory header element. 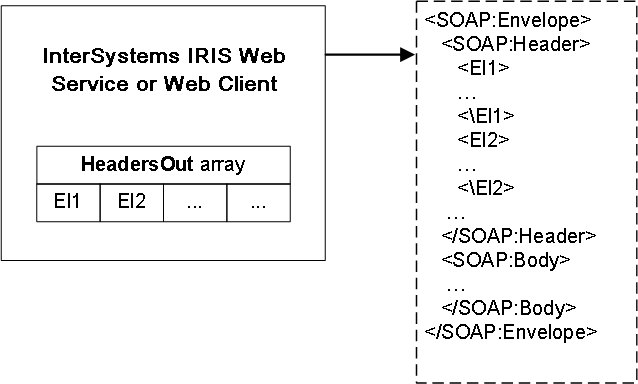 Following the SOAP standard, InterSystems IRIS rejects SOAP messages that contain required but unsupported header elements. Specifically, if InterSystems IRIS web service or client receives a message that contains a header element that includes mustUnderstand=1, and if that service or client does not support that header element, the service or client issues a SOAP fault and then ignores the message. If you use the SOAP Wizard to create an InterSystems IRIS web service or web client based on a given WSDL, the system generates classes to represent any header elements as needed. For each custom header element, create a subclass of %SOAP.Header. Specify the NAMESPACE parameter to indicate the namespace of the header element. Specify the XMLNAME parameter to indicate the name of the header element. In the subclass, define properties to contain the header information you need. By default, your properties are projected to elements within your <Header> element. Optionally specify the XMLFORMAT parameter, which controls the format of this header element. By default, the header elements are always in literal format (rather than SOAP-encoded). For details on customizing the XML projection of any given object class, see the book Projecting Objects to XML. To add custom header elements to a SOAP message (from either the web service or the web client), do the following before sending the SOAP message. Create an instance of your header object. Set the properties of that object as appropriate, optionally including the actor and mustUnderstand properties. Add the new header to the outbound header array, the HeadersOut property. This property is an array with the usual array interface (for example, the SetAt(), Count(), and GetAt() methods). If you perform these steps in a utility method, note that the method must be an instance method and must be a member of an instantiable class (not an abstract class, for example). When you invoke this web method, the header is added to the SOAP response. InterSystems IRIS web services and clients automatically support WS-Addressing and WS-Security header elements, but do not automatically support other header elements. Associate the header element classes with header elements for the web service or web client. Add an XData block to the web service or client class. In this XData block, specify an association between specific header elements and the corresponding header element classes. If the service or client class also sets the class parameter USECLASSNAMESPACES to 1 (the recommended value), then this header information is used in the generated WSDL. In your web service or web client class, specify the SOAPHEADERS parameter. In this parameter, specify an association between specific header elements and the corresponding header element classes. This technique is less flexible, does not affect the generated WSDL, and is now deprecated. The following sections give the details. If you create a web service or client manually, you must manually specify this XData block. The XData block can have any name. The name (NewXData1 in this case) is not used. The SOAP Wizard uses the name parameters when it creates this block. 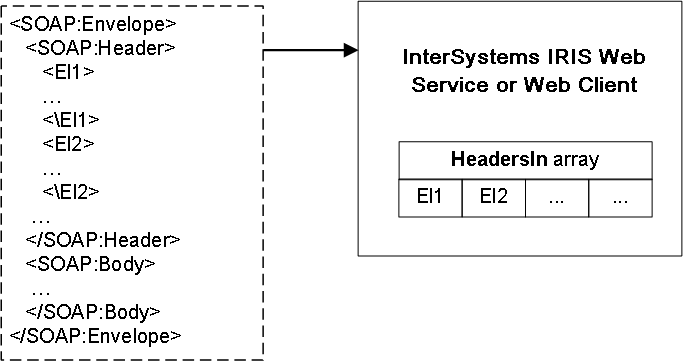 The <parameters> element and all its child elements (and their children) must be in the namespace "http://www.intersystems.com/configuration"
<request>  Determines the header elements associated with all request messages, for any header elements that should be the same in all request messages. This element should have a child element <header> for each applicable header element. <response>  Determines the header elements associated with all response messages, for any header elements that should be the same in all response messages. <methodname>  Determines the header elements associated with the web method whose name is methodname. <header>  Determines the header elements associated with request and response messages for this web method, for any header elements that should be the same in both cases. <request>  Determines the header elements associated with request messages for this web method. <response>  Determines the header elements associated with response messages for this web method. name Name of the header element. class InterSystems IRIS class that represents this header element. alias (Optional) Key for this header element in the HeadersIn array of the web service or web client. The default is the value given for the name attribute. The position of a <header> element within the XData block indicates the messages to which it applies. If you create a subclass of this web service, that subclass inherits the header information that is not specific to a method  the header information contained in the <request> or <response> elements that are direct child elements of <parameters>. This is true even if SOAPMETHODINHERITANCE is 0. The older way to specify supported header elements is to include the SOAPHEADERS parameter in the web service or web client class. This list identifies all headers supported in the SOAP requests to this web service or client and indicates the class to which each one is mapped. For a web service, this technique does not affect the generated WSDL. It is not possible to specify different header elements for specific web methods. The SOAP Wizard no longer generates the SOAPHEADERS parameter in your generated web service and client classes. If you create a subclass of this web service, that subclass inherits the SOAPHEADERS parameter. This is true even if SOAPMETHODINHERITANCE is 0. To use specific SOAP header elements after receiving a request message, use the HeadersIn property of the service or client. For each supported header element, the service or client creates an instance of the appropriate header class and adds the header to the inbound header array, which is the HeadersIn property. This property is an array with the usual array interface (for example, SetAt(), Count(), and GetAt() methods). The web service or web client can then act on these headers as appropriate. The header element namespace is not used for matching the header element in the list. However, the header element namespace in the SOAP message must be the same as specified by the NAMESPACE parameter in your header element subclass; otherwise, an error occurs when the message is imported.